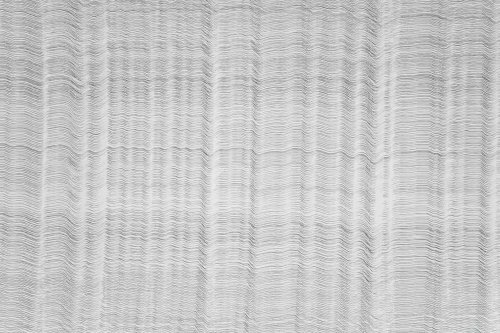 Jason Wallis-Johnson: Moiré (1300 Lines). The title of this exhibition – the second in a series – comes from Gertude Stein’s account of her first flight in an airplane in the 1930s, when she described looking down at the earth and seeing ‘the wandering lines of Masson’. Using some of André Masson’s drawings of the period as a starting point, this exhibition explores ideas and methods around the concept of the ‘wandering line’, with works by contemporary artists shown alongside 20th-century drawings. Drawings on paper are accompanied by depictions of line that employ unorthodox methods and ideas, from sand drawings to drawings made with silicone, twigs, and light, or emerging as the result of performative actions. There are works by more than 30 artists in this exhibition in the gallery’s new temporary location. They include: Barabara & Zafer Baran, Jack Bilbo, Shane Bradford, Woojung Chun, Michael Druks, John Dugger, John Furnival, Madge Gill, William Green, Anthony Hill, Susan Hiller, Roger Hilton, Linda Karshan, Chris Kenny, Liliane Lijn, Jeanne Masoero, André Masson, Alastair Morton, Victor Pasmore, Clay Perry, John Plowman, Ralph Rumney, Harald Smykla, N.H. Stubbing, Paule Vézelay, Jason Wallis-Johnson.